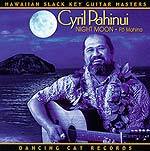 CD reviews: "Wa'ahila," "Night Moon/Po Mahina," "Sacred Island" and "Legends of Ukelele"
This review first appeared in the September 19, 1998 edition of the American Reporter. Forget the tourist bars, Don Ho and "Fourteen on the right, fourteen on the left ..." That stuff is about as representative of Hawaiian music as Billy Ray Cyrus is of bluegrass. There are some outstanding Hawaiian artists on the scene today, both preserving their traditions and pushing them forward  if only you know where to look. One of the best sources of traditional Hawaiian music is also one of the most unlikely  a subsidiary of Windham Hill Records, the new age outfit. George Winston's Dancing Cat Records has been producing the Hawaiian Slack Key Guitar Masters Series for some years now, and has released two new discs in the series. 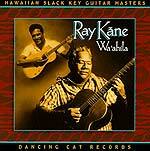 Slack key involves raising or lowering some strings from the traditional Western guitar tuning. The Hawaiian slack guitarists finger-pick, like the American bluegrass guitar and banjo players, giving the music a very full and intricate sound. It's quite melodic, sometimes solo and sometimes with vocal accompaniment. And while the guitar isn't native to Hawaii  having been brought there by the Spanish in the early 1800s  the slack style is very immersed in the traditional Hawaiian song structures and melodic themes. Ray Kane and Cyril Pahinui represent two different generations of slack guitarists, Kane having been born in 1925 and Pahinui a quarter century later. But they share a common devotion to preserving Hawaii's native traditions against the dominant Hollywood culture, and their playing is more alike than different. Given that both were influenced by Cyril's late father, Gabby Pahinui  the most famous and arguably best of Hawaii's slack-key guitarists  the similarities between Kane and Cyril Pahinui aren't really surprising. Both men play a very sparse music; their improvisations are thoughtful and tasteful, the arrangements lean. Listeners familiar with Leo Kottke or John Fahey will find this familiar territory. Pahinui is also a very evocative singer with a rich, baritone voice. True to his heritage, Pahinui sings only in Hawaiian. While Pahinui and Kane are devoted to preserving the distinctiveness of Hawaiian music and culture, Taj Mahal is doing his best to meld the islands' sound with others from around the world. 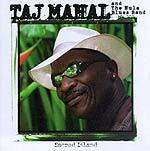 Much as he has done with Caribbean musics and the blues, Mahal uses his latest album to tackle blues and Hawaiian music. And so he surrounded himself with Hawaiian musicians and recorded a set of some Hawaiian, some blues and some new stuff he wrote. "Sacred Island" is never as self-consciously Hawaiian as, say, Paul Simon's "Graceland" was self-consciously African. You have to listen carefully to find specific Hawaiian influences on most of the songs. Then again, if you give up worrying about such things and simply listen to the album as a collection of new songs, it's a pretty strong outing for Mahal. Because when it's all said and done, "Sacred Island" isn't so much a blues album or a Hawaiian album  it's a Taj Mahal album. And that's hardly a bad thing. Not nearly as blues-oriented as other recent albums from the multi-instrumentalist Mahal, "Sacred Island" is more reminiscent of his early career when he was willing to try just about anything. There are still the Caribbean streaks here and there, and the blues permeates everything of course  but there's also a bright-eyed joy and sense of exploration about this collection that sets it apart from his straight-ahead blues. 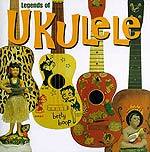 Which brings us to the oddball of the bunch, Rhino Records' "Legends of Ukelele." The logical response to the release of such an album is to ask if that isn't akin to having a "Giants of British Cuisine" cookbook. But don't let Jim Beloff hear you ask such a disparaging question. The producer of this compilation and author of a history of ukeleles (really  "The Ukelele: A Visual History"), Beloff presents an interesting slice of ukelele recordings and provides an interesting history of the instrument in his liner notes (it is descended from a small Portuguese guitar brought by sailors in 1879). The songs are a balance of schmaltz and tradition, Western avant-garde and authentic Hawaiian culture. And so we get Arthur Godfrey and Eddie Kamae, Ian Whitcomb and Jesse Kalima. And, yes, of course, Tiny Tim. The uke is a real instrument; shaped like a guitar and roughly the size of a mandolin (or a little smaller), but with four strings to a guitar's six or a mandolin's eight (although a mandolin is double-stringed, so it's played like a four-string instrument). Some of the songs show the ukelele off as a legitimate instrument. "Tip-Toe Thru' the Tulips With Me" wouldn't be one of them, but Ohta-San's instrumental reading of the touristy "Little Grass Shack" surprisingly is. With a rich vibrato tone and a smart arrangement, Ohta-San's touch on ukelele is as sophisticated as Barney Kessell's or the late Joe Pass' jazz guitar. And here's a treat: Jiminy Cricket singing and playing uke. Seriously. Cliff Edwards, the voice of Jiminy in the original "Pinocchio," is included in this collection from a 1928 recording of "That's My Weakness Now." On the more frightening side would be Johnny Ukelele's "Hawaiian War Chant"  the lounge stylings make it sound more like "Hawaiian Jacuzzi Chant." On Godfrey's "Makin' Love Ukelele Style," we get to hear a baritone uke, which is in roughly the same range as a guitar. And on Beloff's own song, we hear a tenor ukelele  higher pitched than a baritone, but not as tinny as a standard uke. The oddest instrumentation, though, goes to old-timey British entertainer George Formby  on his 1933 recording of "My Ukelele," he's playing a resonator uke, or banjulele. Then there are the songs you never thought you'd hear played on ukelele (or at least hoped you wouldn't): "Johnny B. Goode," "Misty," "Stars and Stripes Forever," "Lulu's Back in Town." While much of this release is, as mentioned, campy (and that's being euphemistically kind), there is enough of the real stuff here to prove that the ukelele  for all the jokes surrounding the diminutive guitar  is a legitimate instrument capable of being used to make great music.